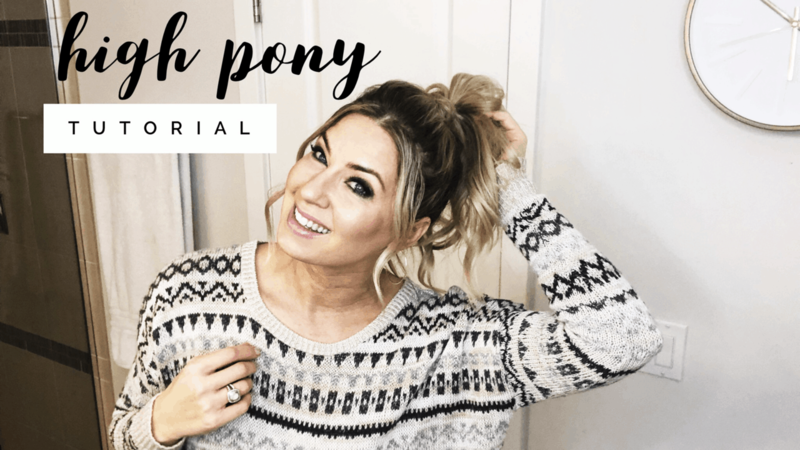 A Mom’s High Ponytail Tutorial 2019! Dress Up That Casual Look! This style is so so cute!!! It dresses up any outfit or style. I often forget how changing my hair can change the entire vibe of my look and it doesn’t cost extra! That’s a win in my book. This high ponytail would also work if you don’t have time to wash your hair but want to look put together and feel cute! It adds volume, texture and a little grit for styling plus it smells amazing!!! Then bring the rest of your hair up and add the second elastic (preferably one that matches your hair color.). Remember, it’s not about perfect structure, it’s about “a little messy and little fancy” when it comes to hair. As I watch this video, I’m thinking I need more blonde put in my hair. The next step is to take a small section from the back, wrap a half-inch section of hair around the elastic to hide it and then wrap little hair around the end of the bobby pin before you secure it under the ponytail. I hope you’ve enjoyed this and I’d love you to tag me in Instagram or in your Instagram stories so I can see your finished look!